Step One - Contact a FORTIFIED Evaluator. 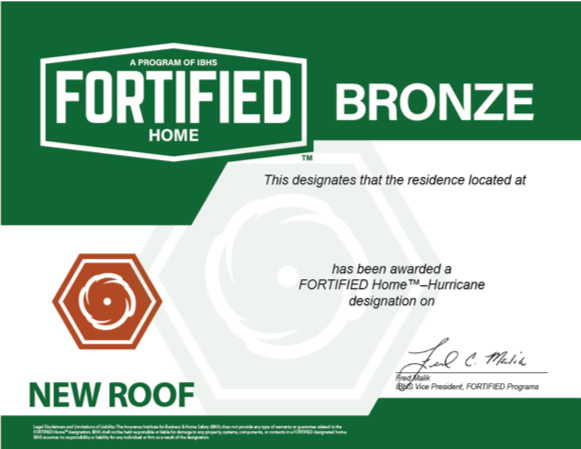 If you do nothing else, contact a FORTIFIED Evaluator™. 1) Contact A FORTIFIED Evaluator Do this first! They’ll verify and document all the work and submit your final inspection report to IBHS engineers to make sure your home meets national FORTIFIED™ standards. 2) Get your Current Conditions Report EXISTING HOMES ONLY. This report tells you what needs to be done to get FORTIFIED. Once you have your Current Conditions Report, contact your Evaluator to develop a scope of work for contractor bids, or if you have any questions. 4) Choose your contractor While you can use any contractor to build FORTIFIED™ (as long as they strictly follow the guidelines), FORTIFIED Wise Professionals have gone through specialized training to understand the program. These contractors and builders can help guide you through the process. 5) Use the right products Aside from proper installation, the right products are key to FORTIFIED. The FORTIFIED standards outline what testing standards products must meet for a home to be designated. 6) Take Action Let your Evaluator know you’ve decided to build FORTIFIED. Then, connect your Evaluator and contractor by phone, email, text or in person. The Evaluator has to be involved in the process from start to finish. 7) Let Your Evaluator Document the Work They complete all the paperwork, take pictures of all the work and submit a detailed report to IBHS engineers who review and approve FORTIFIED Home Designations. 8) Shop or Save Money on Your Insurance Once you get your FORTIFIED Home Designation (a certificate), shop around for your insurance. You may be surprised at the savings available depending on where you live. Not shopping for insurance can cost you. Learn how to save $ and get the coverages you need.